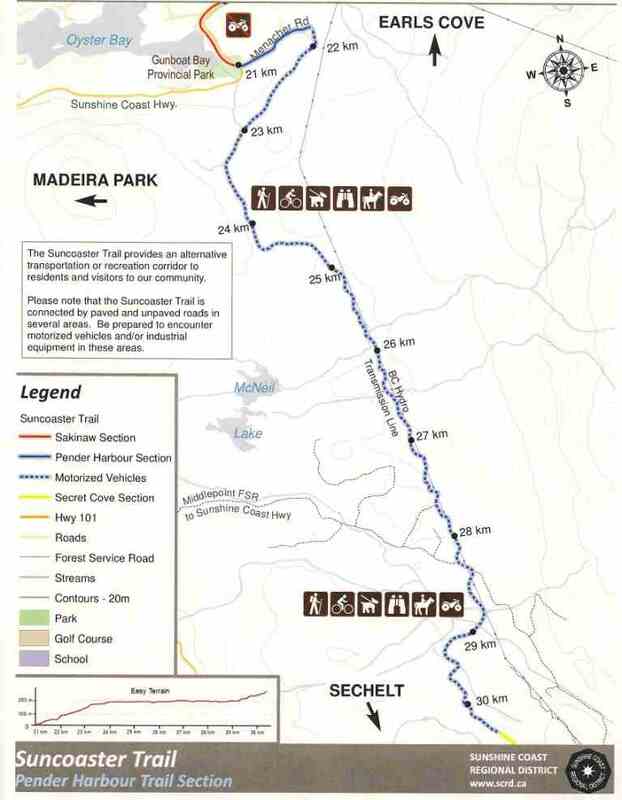 This third section of the Suncoaster Trail begins at Menacher Road and runs 9 km towards Secret Cove/Halfmoon Bay area. The terrain is moderate to easy. I love this section of the trail. It has access to the trails around McNeill Lake which are some of my favourites - Copperhead, Dry Feet, Old Pole Road, etc. It also has a pretty stretch between Middlepoint Forest Service Road and Homesite Creek Forest Service Road. Along this piece you will pass a little lake called Lone Owl. Click on the map below to download a pdf version. Click here to return from the Suncoaster Madeira map to the Suncoaster Trail page. Click here to return from the Suncoaster Trail to the Sunshine Coast Trails Home page.